It's beginning to dawn on me that I will not clear out my sample backlog by the end of the year, in fact, I'm thinking maybe I will never clear my sample backlog. All the same, it doesn't hurt to try, right? Here are a few more unrelated quickie perfume reviews. Ed Hardy's fourth fragrance for women, Born Wild, is just what you'd expect — a sweet-ish, middle-of-the-road fruity floral in their signature tattoo-inspired packaging. The fruit du jour: peach. Born Wild is light (think spring/summer rather than winter/fall), clean and inoffensive, and the lasting power is reasonable enough. Ed Hardy Born Wild For Women was developed by perfumer Calice Becker, and is available in 50 and 100 ml Eau de Parfum and in matching body products. Shown above is a gift set with 100 ml Eau de Parfum, 90 ml each of Shimmering Body Lotion and Bath and Shower Gel, plus a travel spray and luggage tag, $75 at Macy's. There were three fragrances in the recent We Love New York trio from French organic niche brand Honoré des Prés. I already reviewed I Love Les Carottes, and Erin is going to be reviewing Vamp à NY soon. 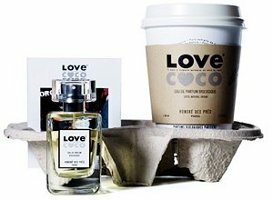 I gave Love Coco, the third of the trio, a quick smell when it arrived, and immediately dumped in in my (huge!!) basket of samples that I'm done with but that need to be filed. A week or so later, I was thinking about Love Coco again, do I dug it back out, gave it another shot on skin, then dumped it right back in the basket. You already know how this goes, right? Love Coco is an odd little Asian-food-ish sort of mixture of coriander (leaves and seeds), coconut milk, tonka bean, vanilla and cedar, and it's either disgusting or wonderful, I can't quite decide. Whatever it is, it's not boring: I will remember it long after Ed Hardy Born Wild has faded from my brain entirely. Honoré des Prés Love Coco was developed by perfumer Olivia Giacobetti and is available in 50 ml Eau de Parfum. I love iris in general, and hey, the packaging on Crabtree & Evelyn's new Iris perfume is mighty cute. As it turns out, the fragrance isn't bad either. I don't think your average iris-fiend perfumista (by which I mean me) is going to die and go to heaven, but it's a nicely done floral with a sharp fruity opening and a darkish (read: there's some very clean patchouli) iris-y base, earthy but not too earthy, more creamy-velvety than powdery. I was all set to tell you that it's a step up from the usual offerings at Crabtree & Evelyn, then I stopped to try to remember the last time I put a perfume from Crabtree & Evelyn on skin and realized I have no idea if it's a step up or not. Anyway, it's a step up from what I remember of Crabtree & Evelyn back in the day, and the price is quite reasonable. 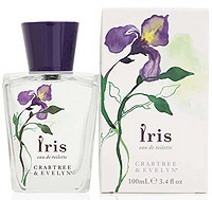 Crabtree & Evelyn Iris is available in 30 ($25) and 100 ($45) ml Eau de Toilette, and in a gazillionty bath, body and home fragrance products. I do like that Crabtree and Evelyn bottle though. I went just the other direction with Love Coco—loved it at first sniff, tried it again, was a little put off by it the second time. I thought it might be a nice summery (coconut/suntan lotion-y) scent but it might just be too foody even for that. But it’s definitely unusual! It’s not sweet enough to be that kind of summery suntan lotion, is it? I think of it as closer to savory food than dessert. C&E has made some lovely fragrances over the years IMHO, R. I loved their long-discontinued Violet fragrance. This one was lovely, too, but not a ‘Must Have!” breakthrough in iris fragrances. Thanks R, you’ve been keeping better track than I have. I did not much care for the 2 India Hicks scents they did, but admit I didn’t put them on skin and haven’t smelled anything else there lately. Thanks Robin, I’d been hoping something would show up about the CE Iris. I had wondered. As for the India Hicks, a couple of years ago, my mother got me the Nadira for Christmas. I don’t know what it was about it, but after putting it on, I started having problems smelling everything (everything other than Nadira, that is.) By the time I’d managed to scrub it off (and that was no easy feat either) my entire oral-nasal-sinus cavity felt/tasted like I’d been licking/eating dryer sheets. Ouch! Hope you got to exchange it for something good. I think the C&E Iris is gorgeous — really irisy, green, and not oversweetened. I like how unpowdery it is, too. It might not be a holy grail for someone who can afford the niche-ier irises, but for that price it’s a beautiful everyday perfume that someone on a budget (like me!) can spray with abandon. I begged Santa for it earlier this month when C&E was offering 25% off and free shipping. C&E used to make a beautiful clean lemon soap… haven’t seen a store in a long time and don’t know if they still do. I wonder if they have closed some stores? I don’t see as many as I used to. There is still a store in a mall near me though. That’s a good way to put it. And at 25% off it’s a real bargain! Ooh, that sounds like me too. I might give Iris another go then. I sniffed it once at the mall and it did not make much of an impression. But testing scent in the mall when I’m tired, in a rush and have children with me is not ideal. I certainly think many people will find a bottle of this under their Christmas tree. I am thinking of going back to smell the shower gel…I’d love to have an iris shower gel and this is about the right price point. Your attempts to clear out your sample back log makes for good reading! C&E used to do a freesia I really liked, but I haven’t seen that lately either. Oh, I did not know plethoranium, thank you! I love ridiculous number words, I will add it to my collection. Ed Hardy must be swankier than I thought….they seemed an odd fit with Calice Becker to me. Maybe the packaging gives me the wrong impression. I get more compliments when I wear C&E Evelyn Rose than anything else. That is probably partly because I’m a discreet dabber overall , but I wear the Evelyn Rose with the lotion and powder, so they probably just notice it more than anything else I wear. It’s everything most perfumistas hate about roses…powdery and probably very old-lady-ish, but but it garners praise for sure. (My various physicians, mostly male, mostly in their 30s) always comment on it. CB has done some pretty diverse things — including the latest designer scent for Avon, Herve Leger. So she doesn’t just do swanky! I will have to give the Evelyn Rose a try…I like a good old lady rose. The Avon didn’t surprise me; maybe swanky isn’t the word I mean. I guess it’s really more that I thought Ed Hardy was more biker-gritty-tattoo-y than it probably is….and even if it were that rowdy, you’re right, she seems diverse enough to handle that with aplomb! When I get over my fear of decanting, I will send you a decant of the Evelyn, Robin; I have loads! Oh, gotcha. I don’t know who is buying the clothes, but for fragrance they do very mainstream fruity florals, geared young…. Oh, and that’s a very kind offer, thanks! Ed Hardy’s son, Doug Hardy, frequents a forum that I read fairly often. Apparently there has been some serious abuse of the licensing of his father’s art (crummy shirts, cheap bobbles, etc) that the family is currently suing over. I dunno if the fragrances count as part of the junk they are upset over (I did not care for any of them), but I have a feeling that they family did not want things to go as mainstream blah as they are. Yes…he licensed his name to Christian Audigier (the real brand name is “Ed Hardy by Christian Audigier”), who appears to have licensed it on to everyone and his brother to make most anything. Not surprised the family isn’t pleased. I enjoy Carottes, Vamp not so much. Haven’t and probably won’t try Love Coco anytime soon unless a sample lands in my lap. Sounds interesting in that love-hate kind of way. Crabtree Iris probably won’t float my boat, but sounds like it would be a nice shower gel or lotion for layering or something. Have you ever tried the Fragrance “Evelyn” By C&E??? It is Quite Remarkable! Exceptionally well done and one of those Powerful ROSE Scents that if you like Me ADORE Roses then you can’t get much better than this! it’s a fresh and not overtly fruity floral with touches of Peach and Watermelon and in the deep drydown and Pale Sheer touch of Sandalwood. It’s one of my ALL TIME favorite scents and i always reccomend that it should be at least given a sniff…. i can bet you’ll fall for it like i did! Do you mean the same Evelyn Rose that JolieFleurs talks about above? No, that’s just fine: you are not required to read all of the comments before you say something! Just wanted to be sure there wasn’t another fragrance called just ‘Evelyn’. Where are perfumers going with all this bland, non-descript fruity tooty stuff? That is a good name, too bad if the bottle is ugly!